In most cases, PDF files contain a large amount of redundant pages, pages which are useless and only add to the PDF bloat. You can have 400 pages in your PDF, yet need to work with only 30 of them. For the general user, this bloat and extra pages are a nuisance. Not to mention that the more pages you have, the bigger your file is. If you want to send a PDF file to someone, to upload it on a website or to free some memory on your computer, you can consider removing unnecessary pages from your files. 1Click on the Open icon from the menu bar and select the PDF file. 2Click on the Edit menu and then on Delete Pages. 3Choose the number of pages you wish to delete. If you want to remove only one page, type the same number in the fields “First Page” and “Last Page”. You should do the same if the pages are not consecutive and repeat the process for every page you want to delete separately. If the pages you want to remove from a PDF are next to each other, you can type the page numbers in those fields. Click on the Delete button then close the file by clicking on the X button. You will be asked if you want to save the changes to the file so if you change the mind, you can cancel the whole process. 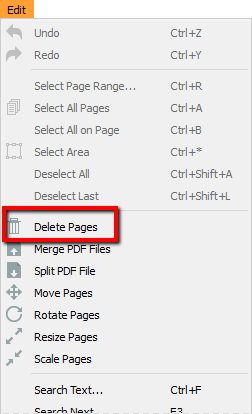 There is a way to delete some parts of the pages in a PDF document, in situations when you don’t want to get rid of the whole page. To do that you need to start PDF Converter and open a PDF. 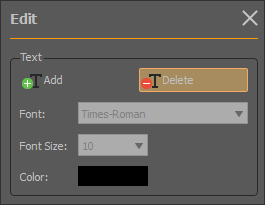 Again go to Edit toolbar and instead on choosing Delete Pages, click on Delete button in the Text section. Now click on area of the PDF page to remove the parts that you don’t need anymore. The downside of this solution is that your document may have empty space but if you want to print a document, this can be a way to save some printing ink, by deleting unnecessary parts.